NDAWN sites are found throughout the state and provide basic and custom measurements for a variety of individuals and institutions. North Dakota agriculture ranks high in the nation’s crop production: No. 1 in durum and spring wheat, barley, sunflower, flax, and all edible beans, No. 2 in oats and all wheat, No. 3 in potatoes, and No. 4 in rye and sugar beets. To maintain these rankings, our agriculture must continue to produce high quantities of quality crops despite unpredictable attacks from diseases, insects, and other antagonistic factors. Pesticide application, although environmentally controversial, is the farmer’s main tool to control crop diseases and insects. Scientists have identified the critical weather conditions that control development of some organisms, and have written programs that mimic or model this relationship. By using current weather data as input, a computer model can accurately track a specific disease or an organism’s stage of development. Based on this information, a farmer knows if and when to spray pesticides, minimizing the potential health and litigation issues arising from spray drift, which are always of concern with pesticide application. In 1989, weather monitoring systems were installed under the supervision of John W. Enz, NDSU agricultural climatologist, at six agriculture experimental stations across North Dakota. 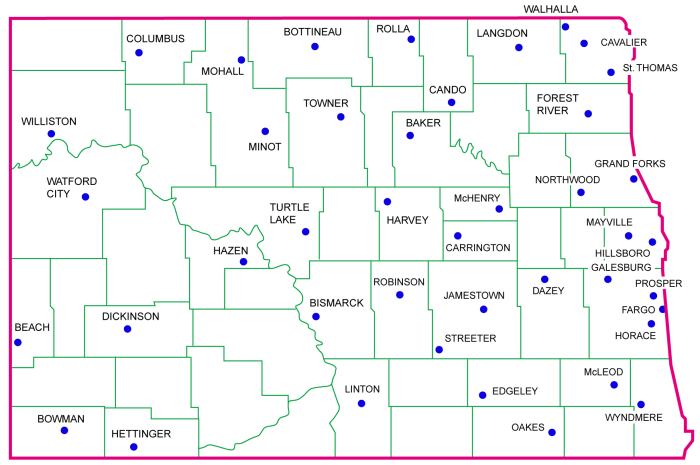 Today the system has grown to 50 weather stations, and is known as the North Dakota Agricultural Weather Network (NDAWN). NDAWN sites span the state and provide data critical to the application of pesticides. It is an environmentally sound electronic weather monitoring system, and is managed by John Enz (professor) and Radu Carcoana and Greg Brockberg (research specialists) from NDSU, Soil Science, Climatology Section. The data collected by this system are used by an increasing number of individuals and institutions for an amazingly wide variety of purposes. Our standard weather stations measure air temperature and relative humidity with a Vaisala HMP35C sensor, wind speed and direction with Met One 014A and 024A sensors, solar radiation with LI-COR LI200S and LI200X pyranometers, rainfall with a Texas Electronic TE525 tipping bucket rain gauge, barometric pressure with a Vaisala PTA427 sensor, and soil temperature at 10 cm depths under bare and turf cover conditions with thermocouples or thermistors. Data are recorded and summarized hourly and daily by 41 CR10 dataloggers and nine 21Xs. All sites are accessed by phone: 37 with DC112 phone modems (seven with cellular phones), and 11 with VS1 voice modems. Two stations are accessed via radio telemetry. Voice modems provide instantaneous weather data (wind speed and direction, temperature, relative humidity, and the amount of precipitation since midnight). The data helps farmers decide if the appropriate legal weather conditions are met for ground or aerial pesticide spraying. Seasonal sensors are installed at several stations to monitor specific parameters. Temperature and RH under a mature sugar beet canopy (one foot from the ground) is measured with an additional HMP35C. Several extra thermistors are used to measure the temperature of the sugar beet root and crown at harvest time. Solar radiation is an important parameter in calculating the crop potential evapotranspiration (PET). PET is used to calculate the daily and weekly crop water use, which helps farmers decide when and how much to irrigate. Beyond the basic measurements, special research projects require certain stations monitor other variables via Campbell’s AM416 multiplexer. At two sites, temperatures are monitored at 14 depths (10 feet max) under highway pavement in a joint research project with the ND Department of Transportation. Ground water level is monitored in water wells, as part of a long term NDSU research program in the Sheyenne National Grasslands. Soil temperatures are measured once per hour at 12 depths (6 feet max) at 13 stations around the state as part of an ongoing research project. At another site soil temperatures are profiled in locations on both north- and south-facing slopes. To provide accurate, reliable data (because bad data is worse than no data) we have concentrated our efforts to finance and develop an exigent program of quality control (QC) and preventive maintenance (PM). QC is upheld by two daily data quality control filters. One is performed by the High Plains Climate Center in Lincoln, Nebraska, which also retrieves daily data. The second is performed by the research specialists from NDSU. PM minimizes station downtime and expense, but requires a good supply of factory-calibrated spare parts, ranging from extra clamps and sensors to CR10s and 21Xs. Each station is visited annually for a standard check-up. We also maintain a detailed log of all actions and events that occurred at each station. In addition to the standard checkups there are emergency situations (besides lightning strikes, bird droppings on pyranometers or in the rain gauge funnel, or snow on solar panel) that require additional travel. The cooperation with applications engineers at Campbell Scientific and their availability by phone is invaluable in pinpointing problems. Their contribution in solving many specific and unusual situations is critical. On one occasion, a problem with a phone line was found in a cooperative effort on a four-way phone conference. Paul, an Environmental Specialist with the ND National Guard (the station’s owner) was in the car, John was in the office monitoring the station by computer, Radu was at the station along with Harris from the phone company, and Bart, the Campbell Scientific application engineer, was in Logan, Utah.